It’s not often we encounter a truly different set of headphones. Recently, Apple’s AirPods wireless earbuds triggered a new rush of manufacturers looking to release their own take on small, wireless headphones. However, prior to this, the last big things to happen in headphones for twenty years have been Bluetooth support and noise cancellation. While this does show general advancement in the market, compared to the frenzied technological explosion in smartphones and computers over a similar time period, headphone technology growth seems downright glacial. This isn’t entirely unreasonable, as headphones traditionally only need to do one thing – play audio. It’s natural to expect that once quality audio reproduction at an affordable price has been achieved, changes may plateau. In the midst of every other manufacturer focusing on cutting their cords, Sennheiser delivers up a highly unique set of headphones. While they may not be the absolute first with the technology, it’s certainly something we don’t see every day. The AMBEO Smart Headset doesn’t just play audio. It doesn’t just offer active noise cancellation either. 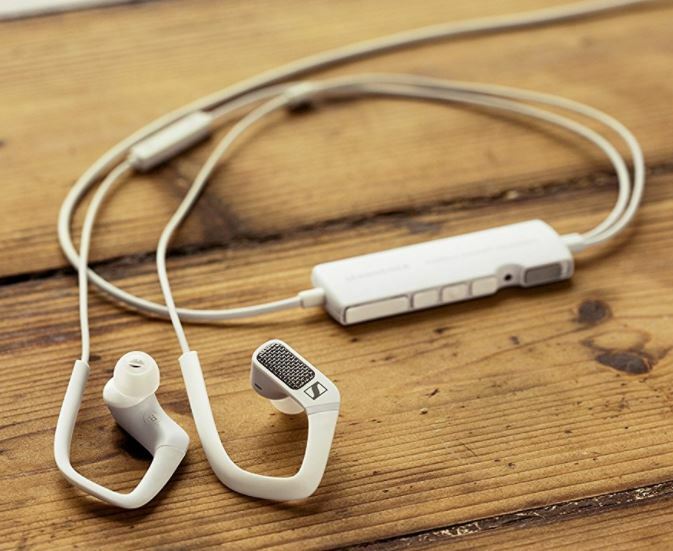 Each earbud has a high-quality, omni-directional embedded microphone which allows you to pick up ambient sound and record videos with remarkably realistic stereo sound. This allows your videos to take on a lifelike, immersive sound quality as if users were hearing them live with their own ears. This is clearly a feature we didn’t know we needed. After testing, we’re still not completely convinced we do. Let’s dig deeper into what the Sennheiser AMBEO Smart Headset has to offer so you can decide if these unique headphones are right for you. We don’t often think about the science behind hearing. Whether listening to music, turning to identify the source of a sound, or simply having a conversation, for most of us, hearing is a background task as natural as breathing. In reality, our brains perform huge amounts of advanced calculations behind the scenes. One advantage to having two ears lies in our brain’s ability to detect extremely small differences in the time each ear receives sound. With this data combined with the positional data available due to the shape of our ears, we can determine with high accuracy where sounds originate in relation to our heads. The term “binaural” comes from root words meaning “two ears.” This differs slightly but significantly from stereo. In a typical stereo audio recording, there are two distinct channels but nothing mandates what each channel contains. An audio engineer may simply separate different instruments on each channel for effect. In a live recording, stereo microphones will create some more natural sound separation, but often the two different microphone channels are only millimeters apart. When listening to a stereo recording, your brain is smart enough to know it isn’t reality. A binaural microphone places two recording channels at the same distance apart as human ears using either a live human or a dummy head. This prevents sound from leaking to the other microphone that would otherwise be blocked by our heads in real life. While this may seem bizarre, it results in audio recordings that have a stunning, life-like quality. When you listen with headphones, the recordings allow your ears to hear exactly what they would have had you been there in person. Though the level of realism absolutely depends on the quality of the recording microphones and listening headphones, binaural recordings can allow for an unprecedented degree of realism. 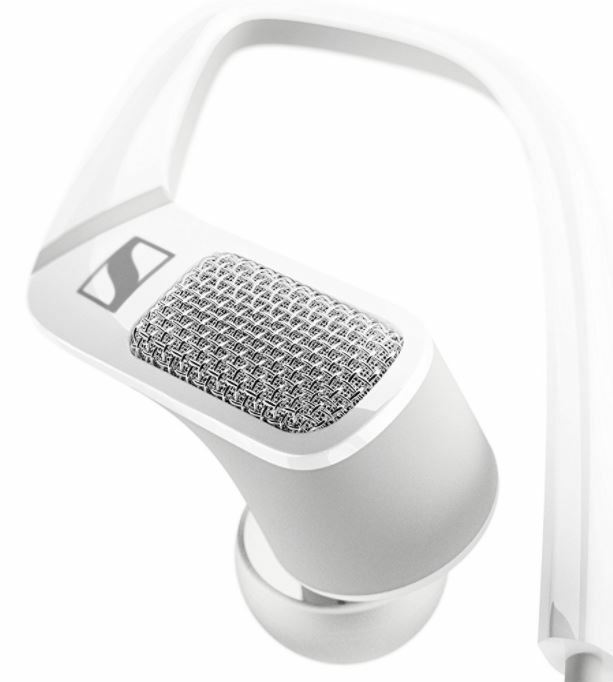 The Sennheiser AMBEO Smart Headset consists of a pair of earbuds with a unique ear hook design. This hook design provides for extremely stable and comfortable extended wearing as well as minimizing any unwanted noise on your recordings due to earbud movement. Most modern headsets only need to pick up audio with enough focus and clarity for a phone conversation. Since the AMBEO boasts high-quality ambient sound, Sennheiser needed larger, omni-directional microphones in each earbud. This shows in the prominent grille on the outside of each earpiece. While a bit unusual compared to other headsets, the gray coloring matches the overall scheme. Had Sennheiser wanted them to go unnoticed, they could’ve kept the same white color, but they clearly wanted the AMBEO to stand out from the crowd in a subtle way. Unlike many recent headphones, the AMBEO does have cords, a necessity due to the additional data and power requirements of recording and listening. The headset has an in-line control box with buttons and switches to control volume and other recording functions. 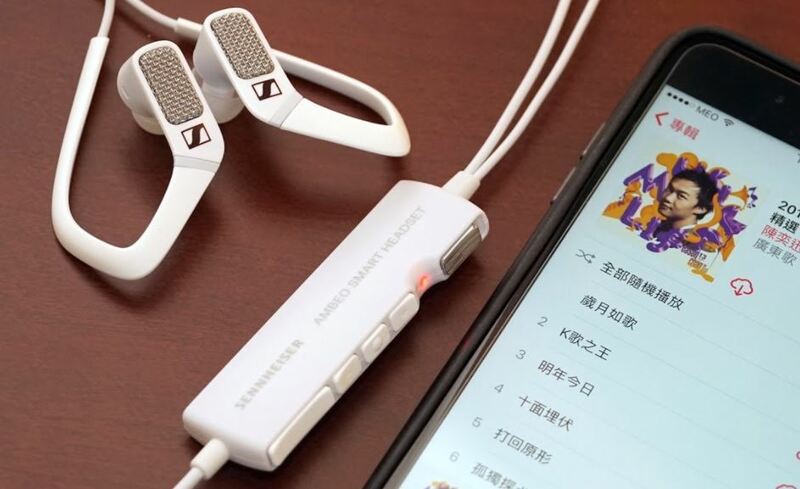 Though Sennheiser suggests they will soon release a version for Android, the current AMBEO only works with newer generation Apple products. 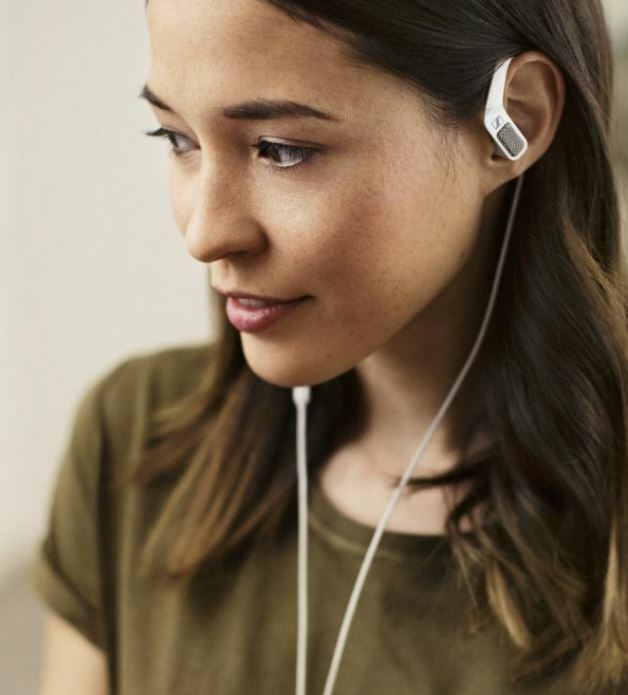 The white and gray design reflects Apple’s standard color scheme, and the Apple MFi-certified Lightning connector means you couldn’t connect to an incompatible device even if you tried. 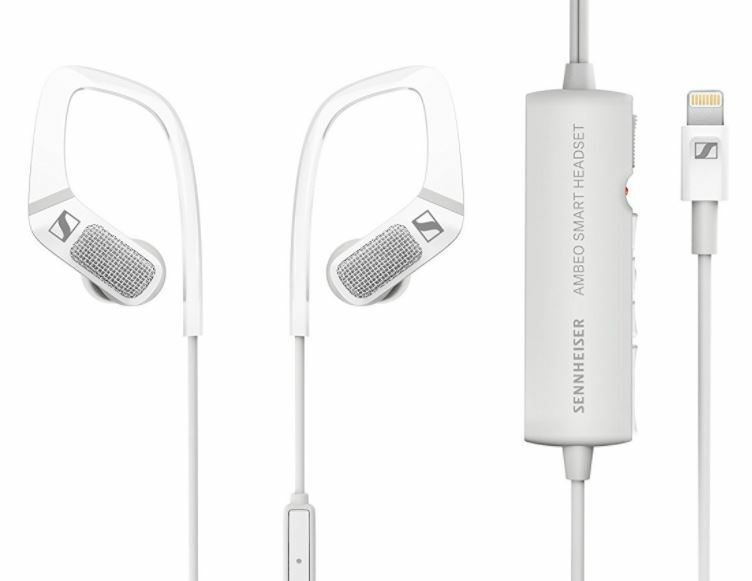 We’re a bit puzzled how Sennheiser plans to release an Android version. Apple’s Lightning connector allows Sennheiser to pass high-quality, two-channel audio in both directions. Android’s standard TRRS audio jack only allows for a single microphone channel, and Bluetooth doesn’t have the bandwidth to support simultaneous audio and high-quality dual channel recording. We’ll see what they have up their sleeve. Binaural recording ability certainly takes top billing for features, but Sennheiser also includes other interesting technology in the AMBEO. 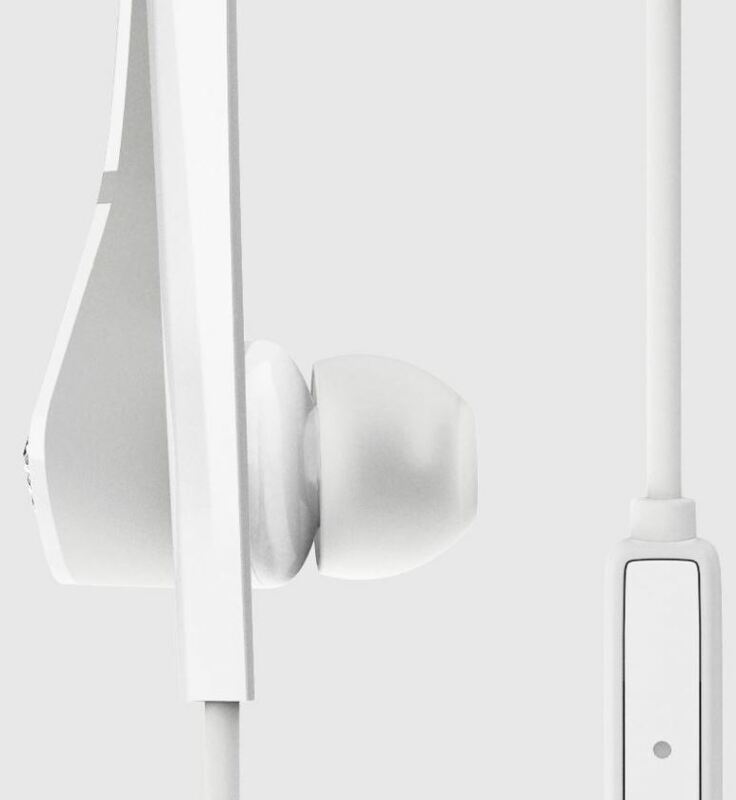 Aside from recording, the embedded microphones also enable active noise cancellation. 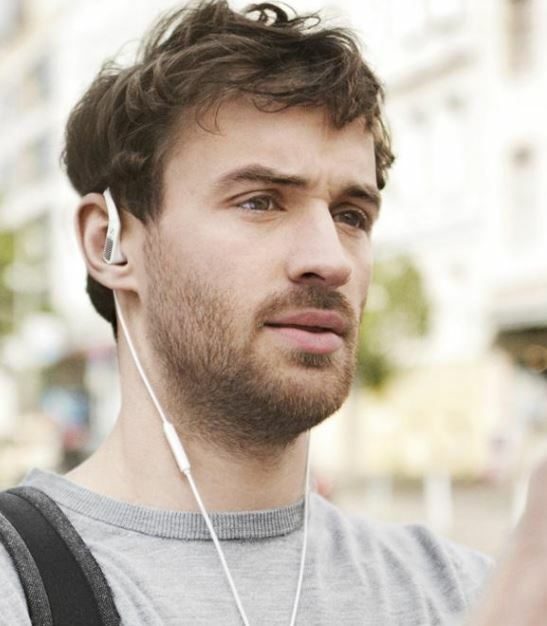 If you’re unfamiliar with the technology, active noise cancellation uses microphones to listen to outside noise. Taking advantage of the physics of sound, the headphones calculate a wave pattern exactly opposite from the external noise and inject it into your audio stream. This added pattern interacts with the external sounds to cancel it out. All you’re left with is your audio. While not perfect, it works surprisingly well particularly with regular, droning noise. Active cancellation may be fantastic for taking public transportation or studying quietly, but it isn’t great when you need awareness of your surroundings. Knowing this, Sennheiser added a feature they call Situational Awareness. Using the rocker switch on the in-line control module, you can choose to block outside noise or allow it to pass through for situations, such as walking on a crowded street, in which you might need to listen to your surroundings. Sennheiser wouldn’t be content recording low quality audio. They partnered with Apogee Electronics, a leader in digital audio interfaces, to utilize their proprietary Soft Limit, mic preamps, and analog to digital and digital to analog converters. This gives you the ability to listen and record rich, warm, and realistic sounding audio even in digital format. Also, you can adjust microphone sensitivity to pick up the subtle sounds of nature on a quiet hike while avoiding blowing out levels in a loud concert. Apple’s MFi program is a licensing process that certifies 3rd party products’ interoperability with their devices. Originally launched as “Made for iPod” in January of 2005, as Apple added iPhones and iPads they decided to shorten the program name to “MFi.” This doesn’t imply non-MFi products can’t work with Apple devices, just that certified ones carry additional promise of seamless integration. We found the AMBEO worked flawlessly with our Apple products. We didn’t encounter any problems getting iPhones or iPads to identify the speakers and correctly switch to the AMBEO as microphone source for our test videos. Sennheiser’s AMBEO SmartHeadset app, available in the App Store for iOS devices, also enables a greater deal of control over the headset. It allows you to adjust equalizer settings, recording levels, active noise cancellation level, and change the function of the Smart Slider on the control module. In our testing, we found the AMBEO a very competent set of headphones. Sennheiser has a range of quality earbuds, squeezing a surprisingly rich sound out of some very tiny drivers. The AMBEO, while not necessarily the best earbuds we’ve ever heard, certainly demonstrates Sennheiser’s reputation for quality. Perhaps more importantly, the recording quality was very impressive. When playing back videos over headphones, the audio took on a rich, spatial depth not possible with the iPhone’s built-in microphone. In a recording of a crowded city street, we felt like we were injected right in the middle of the bustling sidewalk. Honking car horns and yelling voices almost made us want to turn to find the source of the sound. On recordings from a quiet hike, the omni-directional microphones brought out even the subtle sounds of our feet crunching rocks and sticks while chirping birds flew in front and behind. While indisputably awesome from a technology perspective, we did have to stop and consider whether this binaural recording of the Sennheiser AMBEO Smart Headset is a fun gimmick or a must-have feature. There are a few problems. First, it only functions on mobile iOS devices. Even if an Android version gets released, it will still only be compatible with mobile devices. While smartphone and tablet cameras have advanced leaps and bounds over the last decade, they still don’t match the quality of good consumer or pro-grade camcorders. Additionally, even after you record your amazing binaural audio, it can only be appreciated by people watching and listening with high quality headphones. So, the question remains, who is the intended audience for your videos? If you want to create exceptionally high-quality video for production or personal use, are you content shooting on an iPhone? If you just want to shoot video clips for social media posting, will enough of your audience have quality headphones to appreciate the nuance of your recordings? If your videos play back through a TV, phone speakers, or cheap headphones, the effect will mostly disappear. This seems to place the AMBEO in an odd no-man’s-land. It isn’t capable enough for premium recording with a camcorder and may not be worth it for casual recording. While this would be highly concerning if the AMBEO were just a microphone, at least Sennheiser has also made it a quality noise-cancelling headset in its own right. If you don’t mind the additional expense and don’t need to chase the latest cord-cutting trend, this headset can upgrade your videos with a remarkable sense of audio realism. Capture, relive, and share your experiences just as you heard them with the Sennheiser AMBEO Smart Headset.